Okay! 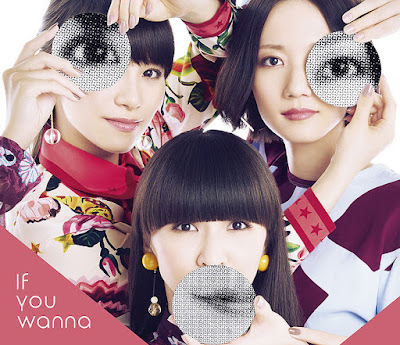 Musume Time: Let's Listen Everyday, But Only If You Wanna - Perfume's 'If you wanna' Single Review! Let's Listen Everyday, But Only If You Wanna - Perfume's 'If you wanna' Single Review! Well, there has been a n overwhelming (meaning: three) surge of requests for this song. After releasing my Music / MV Selection for the month of August, I found myself with a fair few comments regarding this single, and requesting it for review, to boot. It's a bit late, but, here it is; a Perfume review you, for If You Wanna, as requested by Anonymous, Violette and Raaaaainboooows. It's happening, you're welcome, sorry for the wait. Life's been hectic. Despite trying my best to follow Idols and Japanese acts as closely as possible, Perfume is one of those few who have never really stood out to me, not because I find them bad or unbearable, but because they just simply don't flit into my radar. I generally don't go out looking for their MV's, or think to find their music, though there will be the odd one or two times where, for some reason, I feel the need to take a look at their latest release. I'm usually impressed, but, it's never been enough to keep me hooked on them. It's a shame, really. They're a talented trio, and they are entertaining to watch. I just need to find the one. That song and video combo that will hook me forever, and leave me wanting more. Until that happens, however, I will simply have to keep on watching out for them, whenever the desire creeps up on me. This time, it is less about desire, and more about fulfilling a request. Never a bad thing, mind; it's good to take on other peoples requests to see just why they like it, and to give myself something new to listen to, and potentially find a song that will become my brand new jam. It won't always work out, but, if it does, I'm really thankful, and extremely pleased that it was requested of me. And, given how three people asked about this single review, I can't help but be intrigued, at this point. Is it really that great? Has Perfume come out with something that will blow my proverbial socks off? Well, I bloody hope so, because you've all intrigued me, at this point. Thanks, guys. So, we;re gonna head right on into this review, with this being the first time that I hear this single in its entirety. I've not played the song, watched the MV, or even dared to preview the instrumental or opening. It will all be brand new to my ears, written from the get-go in my unbiased, unknowing opinion. Oh, this is gonna be fun. First impressions, A-GO!!! I bloody jumped. This opening just came out of nowhere, and suddenly, I was transported back the whole Perfume style I've heard before, all electronica and high voices, crisp sounds and pixelated happiness. Like, I swear, If you wanna sounds like it should be a debugging program, or a faltering computer going through the dreaded blue screen of death. That said, it's also bloody fun to hear. Is that clapping, I can detect? There's actually a serene feel to the song, despite its loudness, giving a pleasant, calm sound that is oddly appealing. It's just so ethereal and otherworldly in so many ways, from the delicate sound of the members' vocals, to the techno sound of the instrumental that rises and falls in such a smooth manner. The instrumental alone is actually really beautiful, and the moment I hear it, I just can't help but think of how clean it sounds. Every beat and swerve of the elements used to create it feels complete and easily detectable, and that clapping. It stands out perfectly, as does the tinkling that swells throughout the instrumental. 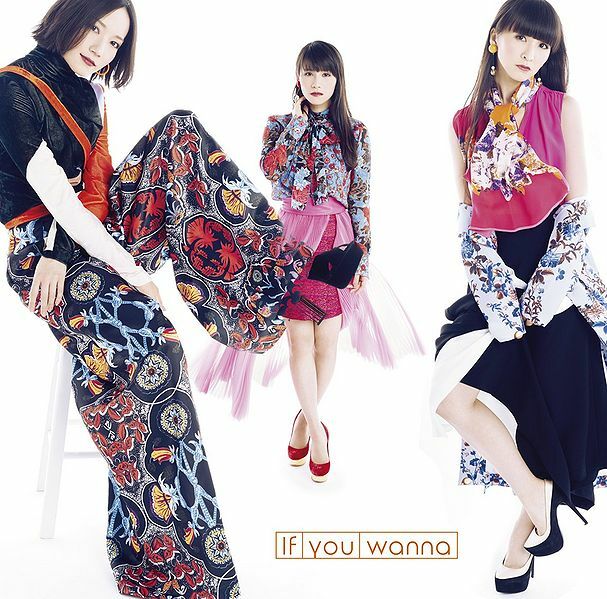 This song works well both ways, actually; with the vocals of Perfume, there's a crisp feel to it that only enhances the ethereal quality of If you wanna, but all by itself, the instrumental wouldn't feel out of place in a club or even in the background. I could easily listen to both, without any problems. The accompanying video is damn pretty, too. It actually matches how I visualise the song itself! A corrupted world, just like a computer going into overdrive, with a slight Science Fiction vibe that is so completely Perfume. It's simple, but very beautiful to watch, complete with a beautiful dance to cap it all off. If you wanna is so good, in all the right ways, and I can't find anything to complain about it. Even its short length, at only 2:43, feels full. I don't that this kind of song needs to be any longer, because it's quality is already so high, and honestly, it's perfect as is. Already, this one sounds like a fairy tale waiting to happen. It opens just like a ballad, before the loud vocals enter and completely overtake the instrumental. Not a bad thing, per say, but I was surprised by how loud the voices had become against such a soft, sweet instrumental track. It doesn't stay that soft for long, however. It gets pretty loud along the way, but I really like how much it rises in sound, and how fun it becomes. It's one of those tracks that I will shimmy my shoulders to, quite happily. It makes me want to dance, simply put. Oh, and the vocals are hella cute. Have Perfume ever sounded so adorable, before this? I can't remember when they last did, if they have. Much like the lyrics express, this song makes me feel so happy, and this is only my first listen. It's such a catchy, adorable tune, and though the lyrics are fairly simple, they're the sort you quickly latch onto and find yourself singing along to, even if you haven't heard the song that much. Plus, a lot of the chorus is actually in English, making it easier for me to follow along with. Bonus! There is an undeniable sweetness to this track, and much like If you wanna, it's beautiful in both its vocal and instrumental forms. In fact, the original instrumental version of Everyday is so much more gentle and haunting than I could have imagined. It's such a powerful, emotive track all by itself, but there is no denying that the vocals of Perfume bring a sweet, ethereal quality to the music, as well. Individually, Everyday and its accompanying instrumental are brilliant, and I really can't choose a favourite between them. Yet again, I could easily listen to both. They're just so entertaining, and so freakin' pretty. Everyday's accompanying music video, though short, is a nice little watch. Simple but effective in its approach, the use of timing is impeccable here. I just love how the lights time perfectly with the sound of the music, giving off a thunderous effect throughout the video thanks to the fluffy clouds and stormy backdrop. And, despite the cool toned approach to the video itself, the song still feels light and happy, carefree and effortless. It's a nice little use of audio and visual juxtaposition, there. Everyday is a great song, a great instrumental, and a nice little video. It actually compliments the serenity and beauty of If you wanna really well, but still manages to be its own track. It stands out all by itself, and entertains me a great deal. I thoroughly enjoy it, and find the cuteness of the track endearing. I get it. I really get why you asked me to review and look at this one, and honestly, I am thanking you for it. Why it took me well over a month to get this, is beyond me, because wow, this single is bloody brilliant. If you wanna, in its short but impeccable entirety, is gorgeous and a treat for the ears. Sure, it was a bit surprising upon the first listen; I practically jumped out of my seat, it was so sudden and loud, but after hearing it more than once, I feel like I'll be hooked. It's just. So. PRETTY. Plus, the visuals it gives my mind are divine. There is nothing more superb than the flash of corrupted computers going through my mind, and no, I'm not being sarcastic. I like those kind of visuals, so long as its going on in my mind, in a music video or a picture, and not on my actual bloody laptop. That's when my heart will drop. There is something oddly appealing about a computer glitching, at least when it's not mine, of course. Everyday is just as appealing as If you wanna, of course, and thanks to its gentle force and ballad-like quality in the beginning, I fell for it fast. I do of course love both the full and short version of it - both work quite well, actually - and now, having listened to it again after ending If you wanna, I can't help but feel that this song is the musical definition of 'the calm before the storm'. It's gentle and soothing at first, before building into something so much bigger and more defined. It's truly amazing. Plus, singing along to it as easily as I can is always an added bonus for me. In fact, this whole single is a bonus for me, so thank you, to everyone who willed me to actually listen to this song and write up the review. It's visual and melodic, delicate and jagged in all the right places. It's a delight to hear, and once I have one song on, I can't get enough it. Once I put the other song on, however, I wonder how I can choose between the two for a favourite, because they are both so incredible to hear. It's a tie, here; the songs, as well as their accompanying instrumental tracks, are damn-near perfect, and both appeal to me on separate levels. The serene and ethereal feel of If you wanna makes me want to write a fairy tale, whilst the calm-before-the-storm quality to Everyday has me falling in love with the cute and sweet style of Perfume that I've barely heard, before now. Like I've said before: It's all just so PRETTY! There's nothing I dislike about this release. Everything about it is perfect, and yes, it's deserving of all five stars. Actually, I was ready to go overboard, and give it six or seven of the things, because why the heck not? It's a great single, with amazing songs, and beautiful tones that appeal to me on so many levels. How in the heck have I missed such quality, until now? Bless you all, to those who requested this review and enlightened me to the joys of Perfume's If you wanna single release. It's a gorgeous creation of two memorable, delightful tracks, and I doubt I'm gonna leave these sitting in a folder, collecting dust. They must be appreciated, and they must be heard. Anonymous, Violette and Raaaaainboooows, you are stars. Thank you so damn much. Now, it's time to change my blog to 'Everyday! Perfume Time'. Goodbye, Idols, you've been replaced by the superiors. Maybe I'll catch you some other time, when you create such perfection. Until next time, folks. Let's meet one another in the next review! Take care, stay happy everyday, be healthy and joyful, and love those Idols and Artists! Thank you. hey, are you going to review the new mm single?